Jet lag works in mysterious ways. Despite my extreme fatigue from the 30 hours of traveling, I didn’t sleep all that well my first night in Myanmar. I woke up bright and early at about 4:30 am, which gave me plenty of time to prepare for the full day ahead: breakfast with my two cartooning compatriots, then a three-hour session at the American Center with the Burmese professionals, three more hours at the Alliance Francaise with amateurs, and an introduction to an evening film showing back at the A.C.
At breakfast, I tried talking a bit with Émile and Christophe about the workshop, but they seemed unconcerned and confident that it would work out. It turned out that both of them had done gigs like this before — Émile in China, India, and the U.S., and Christophe in India and Algeria. I, on the other hand, had very little hands-on teaching experience. Some years back, I gave private lessons in comics to a rich Upper East Side teenager, and last November I did a mini-comics workshop with Sari at the Miami Book Fair, but that was about the extent of it. 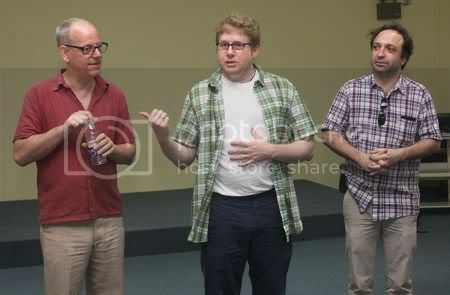 So even though I was a bit intimidated by the prospect of “teaching comics” to men many years my senior (e.g., the Burmese professionals), Émile & Christophe were so blasé about the whole thing that I was content to follow their lead. Wesley picked us up in “Rolling Thunder,” and we arrived at the American Center fifteen minutes later. The Center is in a different part of town from the U.S. Embassy, but similarly fortified and guarded. Directly across the road from the A.C. entrance was a small hut used by the Myanmar military to keep an eye on things. It was really a sad little structure, slapped together out of plywood and “protected” by a couple of sandbags. Most of the time, the hut was manned by two slovenly guards, dutifully noting our comings and goings on little clipboards. A laundry line was attached to one side of the open-air hovel, and some stray dogs loitered around. 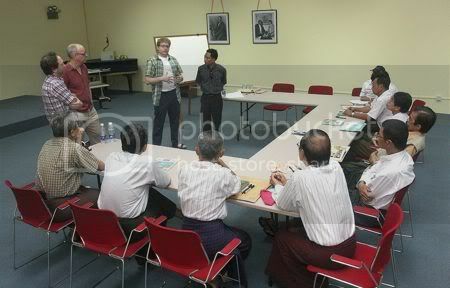 We entered the A.C. to find most of the cartoonists from Monday’s lunch, as well as our translator Aung. I started things off by distributing the pens I had brought as gifts. The men accepted them graciously but in a subdued manner, but I had read that it is considered rude in Burmese culture to over-react to gifts (and to my satisfaction, during the balance of the morning I noticed the artists examining and experimenting with them). The artists specialized in children’s comics, humor, romance, gag panels, and so forth, with a couple having experience in the adventure comics field. It was fascinating to meet practitioners of my same field halfway around the world, and to see how much we had in common. For the most part, their style and approach to comics struck me as much closer to the West than, say, their more nearby neighbor Japan (undoubtedly a result of Burma being a British colony for so many years.) There was one artist who worked more in a manga style, but he was firmly in the minority. 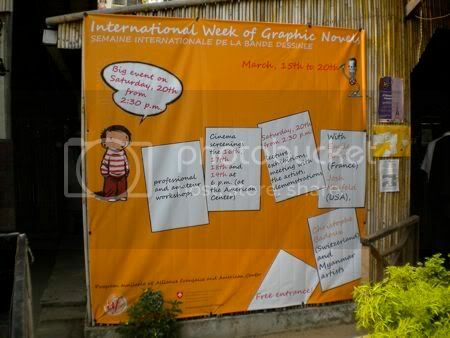 All the men were talented and technically proficient, but again I had that sad feeling that these were people whose creative aspirations had been stunted at an early age; that the Burmese perceptions of the artistic possibility of comics was quite limited. Mutual introductions took up the whole three hours, so I was relieved of stressing out about running a professional workshop until the next day. We ended the session with me handing out signed copies of A.D. to each participant, a gift of the U.S. embassy. Then it was off to lunch and to prepare for the afternoon amateur workshops. I’m loving reading these Joshicles; this is a plum of an opportunity.